In 2004, journalist Michael Kodas joined mountain climbers from New England on an expedition to Mount Everest. He anticipated an exhilarating and arduous adventure among a group of like-minded idealists that he could report to his readers back in Connecticut. But on the Himalayan mountain, he discovered thieves, prostitutes, con men, and blackmailers. There were people who would do "anything" for a quick buck, or a guarantee of reaching the top. And some of them were on his own team. Thieves stole equipment on which the team's lives depended, Kodas's life was threatened by one of his teammates, and a climbing partner was beaten unconscious by another in Base Camp. He returned from the Himalaya disillusioned. But a plea for help from the daughter of a mountaineer who vanished on Everest on the very day that Kodas had retreated from his own disintegrating team prompted him to return to Everest and uncover an underworld that preys on unsuspecting climbers on major peaks around the world. 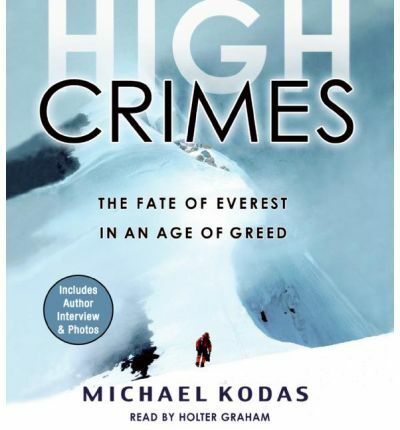 A shocking expose of the dark underside of Everest and written with thriller-like pacing, "High Crimes" is a gripping and fascinating story. About the Author: Michael Kodas is a member of the Pulitzer Prize-winning team of journalists at The Hartford Courant, where he has worked since 1987 as a reporter and photographer. His work has also appeared in the New York Times, the Los Angeles Times, the Washington Post, the Boston Globe, the Chicago Tribune, and Newsweek.He lives in Hartford, Connecticut, with his wife, Carolyn Moreau.